Professional brushcutter with high performance as well as sensational ergonomics and manoeuvrability. Optimized shaft length and bevel gear angled 35 degrees. The X-Torq® engine provide raw power and excellent fuel economy. Very low vibrations thanks to an effective anti-vibration of the engine, drive shaft and cutting equipment. Easy to start with Smart Start®. Delivered with Balance XT harness. 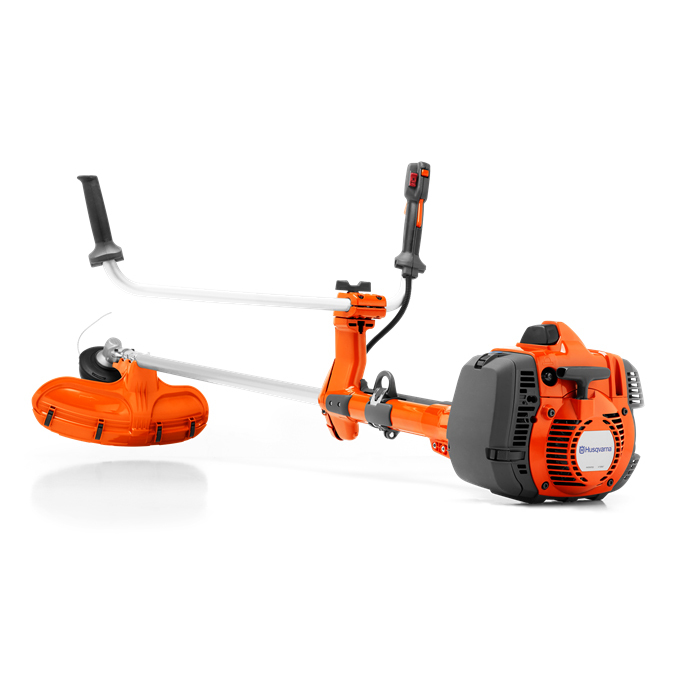 Combi-guard - The cutting attachment combi-guard can be used with either a grass blade or a trimmer head. Auto return stop switch - When the machine is turned off, the stop button automatically returns to start position for trouble free start. Offset handle bar - Angled handlebar and comfort handles provides excellent grip and working position. Easy switch of cutting equipment - Magnetic locking pin holder facilitates switch of cutting equipment. Transparent fuel tank - Transparent fuel tank for checking the fuel level. High offset post - High offset post increases freedom of movement when working on slopes. Adjustable handle bar - Adjustable and ergonomically designed handlebar for best comfort. E-TECH® engine - The E-TECH® engine combines reduced exhaust emissions with a superior power/weight ratio. Balance XT - Ergonomic harness with broad back support, shoulder straps and hip belt that distributes the load over a larger area. Adjustable back plate for perfect fit. Long shaft - Long shaft providing extended reach, facilitating grass clearing. Optimised centre of gravity - Improved balance thanks to the fuel tank placement in front of the engine. Adjustable harness hook eyelet - Adjustable eye let for best balance. Ergonomic handle - Comfortable handle design. Soft grip handles - Soft grip handles for comfortable use.